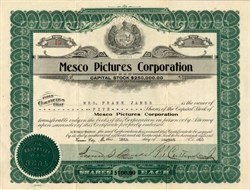 Historic RARE stock certificate from the Mesco Pictures Corporation issued in 1920. This unique document was printed by the Goes Company and has an ornate border around it with a vignette of the Missouri state seal. This item has the original signatures of the Company’s President, Thomas T. Crittenden, Jr. and Secretary, Lynn S. Banks and is over 92 years old. The certificate was issued to issued to Mrs. Frank James who was the wife Jesse James' brother, Frank James. Thos. Crittenden, Jr. a real estate operator, said today a number of business men have taken over a project for the protection of motion pictures in or near Kansas City in which Jesse James, an attorney, again has agreed to portray the character of his father, the early day bandit. Under a former organization of a company for the same purpose James agreed then refused to perform. Under the present organization, which is said to be capitalized under the laws of Missouri for 1-4 million dollars, Thomas Pendergast is president, Thomas Crittenden, Jr., vice-president and Lynn S. Banks, secretary and treasurer. The company is incorporated under the name of the Mesco Picture Corporation and all stock is said to be subscribed. Local talent will be used largely in the cast, although it was said several professional performers would be obtained for the pictures. The first picture the company plans to produce will feature James in "Jesse James Under The Black Flag." Thomas Theodore Crittenden, Jr. (December 23, 1863-July 31, 1938) was the Mayor of Kansas City, Missouri from 1908-1909. Crittenden was born near Springfield, Illinois. His father was Missouri Governor Thomas Theodore Crittenden. He was the great-grandson of John Crittenden; grandnephew of John Jordan Crittenden and Robert Crittenden. His father, Thomas T. Crittenden< was governor of Missouri. As governor, Crittenden wanted to suppress the robberies and violence committed by the James Gang. He authorized a reward of $5,000 (which was paid for by railroad corporations) for the capture of Jesse James and also for his brother Frank, dead or alive, which resulted in Robert Ford killing Jesse in 1882. Depicts Jesse James' return home to Missouri after the Civil War hoping to live a life of peace, but is falsely accused of robbing a bank. He is forced to take up a life of crime by being branded an outlaw. Crimes are commited and blamed on him, his family is maimed by the Pinkerton Detective Agency, but all the while James is able to perform charitable acts to citizens. James is finally assasinated by Bob Ford. All told in a flashback style by Jesse James Jr. to a eastern baeu asking for his daughters' hand in marrage. 2.Jesse James Under the Black Flag (1921) ... Mesco Pictures Production Company Shows James' joining of the Quantrill's raiders, a guerrilla force which fought against union sympathizers during the Civil War. James takes allegiance to the Black Flag, the raiders' banner. After the war he recieves kind treatment from a judge concerning his acts of crime and later meets and falls in love with Zee, with whom he wishes to live a peaceful life. JESSE JAMES, JR. (1875-1951) "Tim", the only son of noted outlaw Jesse James born in Nashville during the height of his father's career as an outlaw. His mother was Zerelda, Jesse James' wife and his first cousin. James, Jr. later moved to Los Angeles and became an attorney. Mesco would make but two films, both in 1921, both concerning Jesse James, and both starring the younger James portraying his father. The films showed the outlaw in a favorable light - more romantic dramas than realistic documentaries. l life.